At a glance, you would be hard pressed to spot the external differences between the three RX100 cameras. The differences often appear to be modest, yet with each incarnation the actual improvements are enough to make existing users want to upgrade to the new camera. For the majority of users, the larger aperture of the new lens and the shorter 24mm minimum focal length will be more of a benefit than the loss of 30mm, from 100mm to 70mm, at the furthest end of the zoom. The image-quality improvements also take the camera up another notch, offering excellent results where similarly sized compact cameras – but with smaller sensors – start to show their weaknesses. Add to this the built-in ND filter, which will help those who want to take long-exposure images and allow the use of the larger apertures in bright conditions. However, it is the EVF that most photographers will be interested in. The fact that Sony has been able to fit in such a high-resolution EVF, without increasing the size of the camera, is quite a feat. Most enthusiast photographers will appreciate having an EVF, not only for bright sunny conditions, but also for adding stability when shooting. For the more traditional user, it feels like a film compact camera. As a companion compact camera to take with you everywhere, the RX100 III is ideal and DSLR photographers could consider it as a backup. As photokina is being held this year, there’s no doubt that many other great cameras will soon hit our shelves, but Sony has set the bar very high with the RX100 III. This is seated on the camera’s top-plate and allows the shooting mode to be changed quickly. 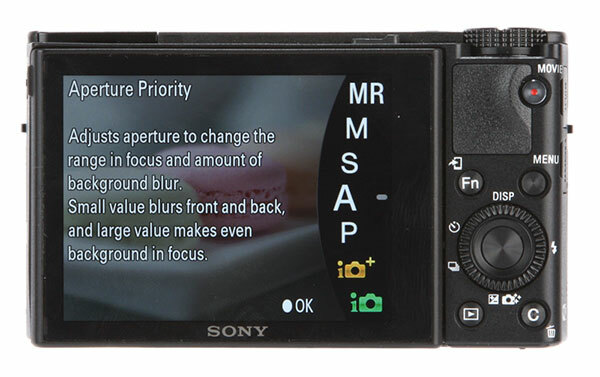 It includes the usual PASM as well as Sony’s Intelligent Auto modes. Touching a compatible smartphone or tablet to this spot on the side of the camera allows instant connection between the two devices. 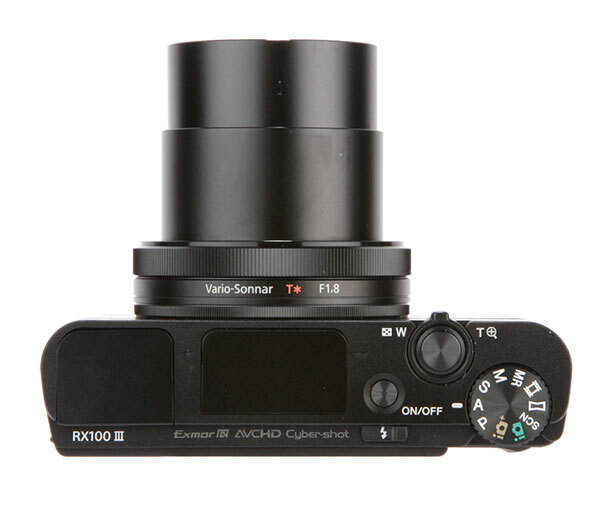 The RX100 III has a 3EV ND filter. This should help when taking long-exposure images, but will also allow the f/1.8-2.8 maximum aperture to be used in bright conditions. Around the barrel of the lens is a dial that can be set to control a number of functions, including manual focus or aperture size. The video-record button is situated so that it can be easily pressed with the thumb. It is slightly embedded, making it more difficult to press it accidentally and start video capture. The EVF is released by a catch on the side of the camera and pops up from the camera’s top-plate.